These were the critters that caught our eyes in FB with pixs of their roe-laden chunks. Crab fiends (there's a few in every family and foodie gang) wouldn't want to pass up on the chance to savour the crabs which are served at Ocean Seafood restaurant in Kota Kemuning. 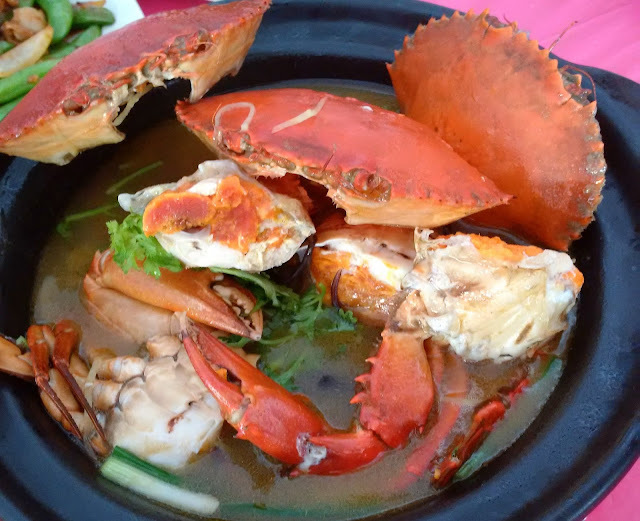 Billed as Signature Crabs in Superior Soup (RM15-RM68 depending on crab size; XXL at RM90/kg), the crabs' natural flavour melded well with the punchy Chinese yellow wine used to cook them. After the first sip, you'd be wanting more. Scallops, squid and prawns were some of the treasures we dug up from the plate of Seafood Fried Rice on our visit to Ocean Seafood Restaurant in Kota Kemuning. There were wispy bits of fried egg and crab meat hugging the rice so my teen almost hogged the entire serving to herself. Obviously it had passed her taste test. As odd as it may sound, the Salted Egg Tofu was the day's show-stealer at this no-frills seafood resto. Both adults and kids tussled over the tasty pieces which had egg tofu speckled with chopped carrot, spring onion and wood ear fungus deep-fried in a light, moist coating of crumbly salted egg. A dish worth returning for. The unassuming looking Signature Claypot Steamed Snapper (RM18-small, RM25-medium, RM28-large) is a notable choice when you dine here. Our order came sizzling hot to the table with the aroma of Chinese wine wafting up to leave us drooling. Sweetish sliced onion, fresh coriander and light soya sauce enhanced the inherent sweetness of the fish. Scrumptious! We also like the well-rounded, slightly caramelised tangy-savoury notes that fully suffused the Assam Prawns (RM18). Very appetising indeed. Its closest rival has to be Sambal Petai Squid (RM18), a speciality that calls for plain rice to capture the resultant bright, zingy heat and strong accents. The chunky pieces of squid coupled with the crunchy okra and stinkbeans were delightful especially for those of us who relished such robustly flavoured offerings. Ocean Seafood also serves crabs prepared in a variety of ways including White Pepper Ginger Scallion Crabs. The white pepper overtone was surprisingly assertive, augmented by the warm biting nuance of ginger. Certain preparations such as steamed with egg, stir-fried with dried chilli or salted egg would require an additional charge. The resto sometimes run special promotional packages with crabs so it's best to call ahead prior to your visit. Tiny silver fish lent crunch to our dish of Scallops with Sweet Beans in XO Sauce (RM18). After the surfeit of seafood, the toothsome beans were partaken with much enthusiasm. Although the resto wasn't air-conditioned, the ceiling fans are adequate enough to keep the heat at bay. We reckon evenings should be slightly cooler. From the number of tables and chairs set aside, this second branch of Ocean Seafood is slowly but surely drawing in its own following after the success of its original brethen in Puchong.